It was close, and the Audi R8 LMS GT3 car pushed them hard to the end, but Timo Bernhard/Marc Lieb/Romain Dumas/ Marcel Tiemann won the 37th edition of the Nurburgring 24 Hour race with their Manthey-Racing Porsche 911 GT3 RSR. Less than one lap behind was the crew of Christian Abt/Jean-Francois Hemroulle/ Pierre Kaffer/ Lucas Luhr in the Abt Sportsline Audi R8 LMS, a new GT3 car making its world race debut. The winning GT3 RSR prevailed after an epic battle on the combined on the Nordschleife and grand prix circuits in front of a huge crowd of 235,000 spectators, completing 155 laps of the 'Green Hell'. 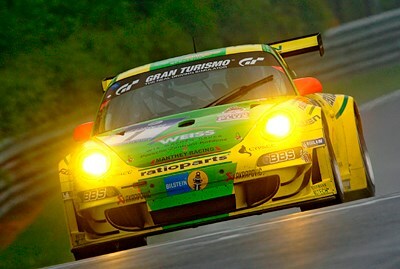 It was the fourth consecutive win for team principal Olaf Manthey, who must have the key to speed and endurance. At the same time, driver Marcel Tiemann celebrated his fifth N&#252rburgring 24-hour race win and now is the most successful driver in the history of the classic endurance-event. "That's just fantastic," said Tiemann . "My fifth win! I just can't believe it. It means even more to me than my maiden N&#252rburgring 24 hour race triumph." The N&#252rburgring crowds will remember the race action for a long time. The 37th edition of the endurance-racing classic started with a one-hour slipstream battle between the future winner, the Porsche 911 GT3 RSR #1, and the Reader-Team's Ford GT. The close battle of Manthey's first-stint driver Marc Lieb with pole-sitter Dirk Adorf at the wheel of the Ford ended only when the Ford made contact with a slower car while lapping it, spun and consequently dropped back. Soon afterwards, the Phoenix-Audi R8 LMS raced by Marc Basseng, Marcel Fässler, Mike Rockenfeller und Frank Stippler closed in on the Porsche and, from then, the two cars alternated as race leaders for the major part of the event. And when this Audi dropped back due to a drive-shaft failure, its sister car entered by Abt Sportsline took the runner-up position. The extraordinary reliability of the Manthey squad's Porsche proved to be the key factor on the way to prevailing against their toughest opponents. European marques dominated with the top 10 inhabited by seven Porsches, two Audis and a BMW. The usual Australian contingent had mixed success. Tony Quinn / Klark Quinn / Craig Baird / Grant Denyer (Porsche 997 RSR) were an excellent ninth outright on 146 laps. Sydney's Rodney Forbes' first attempt at the gruelling Nurburgring 24 Hour was cut short after teammate Marko Hartung crashed the #10 BMW M3 E46 in the high-speed Adenauer Forst section of the circuit as daylight broke just after mid-race distance. In other news, Aston Martin's factory entered V12 Vantage - modified only slightly for competition - swept to a stunning debut class victory and 21st overall. One of the drivers was Aston CEO Ulrich Bez. The British marque's factory-supported Vantage N24 entries took first and second place in the SP10 class.